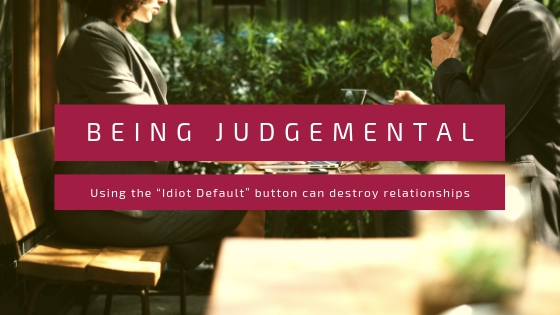 Using the “Idiot Default” button can destroy relationships and is a major reason why many organizations fail to achieve their full potential. Have you ever noticed that businesses have less than perfect employees? They have people who have limitations that sometimes lead to imperfect performance. Have you ever noticed that businesses have limited infrastructures? That means the infrastructure isn’t as strong as it might be. Maybe the company doesn’t have the best resources. Pushing the “Idiot Default” button when the cause of the performance is an infrastructure problem ends in the loss of employee loyalty and enthusiasm for the vision of the company. Most management texts I used as an adjunct faculty member at William Woods University seem to indicate managers spend more time looking for mistakes rather than successes, so most of the feedback offered to employees is centered on finding fault. The texts then continue and explain that such feedback destroys connection and leads to poor performance, vandalism, violence, absenteeism and turnover. Understand employees live in an imperfect world with many forms of problems. Remember managers have limitations and need grace too. Grace breaks down walls of resentment and anger. Grace offers the possibility of organizational greatness rather than just being good. Grace opens the door to employee hearts. At a time in the history of the world when there is such great pressure on all people to perform isn’t it time to let grace prevail? 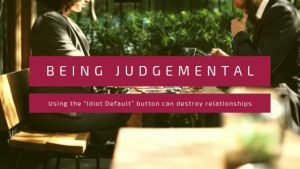 What if, next week, managers left their “Idiot Default” buttons at home, thought the best of their employees, and demonstrated a graciousness and enthusiasm that maybe has been lacking? Frequently I end up picking up the pieces of broken relationships. It is never a pretty sight. But it can be avoided in nearly 75% of the cases with better connections between managers and employees. Make a difference this week.